Architects Simone Giostra & Partners have designed the carbon-neutral Greenpix media wall which will surround the Xicui Entertainment Complex in Beijing, China. The glass curtain wall contains photovoltaic systems which collect solar energy during the day and use it to power an LED display at night. The building is due to open to the public in June this year. Greenpix will be Beijing's first venue dedicated to digital media artwork. 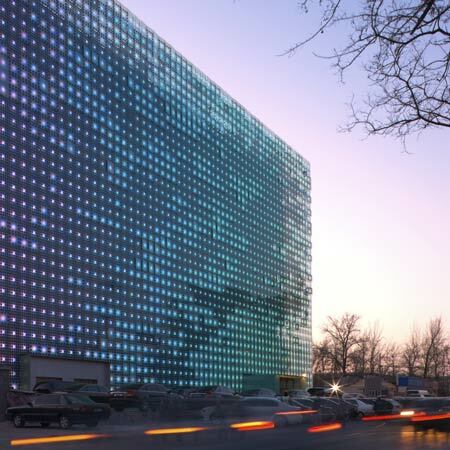 Simone Giostra & Partners Architects have designed the GreenPix - Zero Energy Media Wall - a groundbreaking project applying sustainable and digital media technology to the curtain wall of Xicui Entertainment Complex in Beijing, near the site of the 2008 Olympics. Featuring the largest color LED display worldwide and the first photovoltaic system integrated into a glass curtain wall in China, GreenPix transforms the building envelop into a self-sufficient organic system, harvesting solar energy by day and using it to illuminate the screen after dark, mirroring a day’s climatic cycle. Arup provided engineering services for the project. “The Media Wall will provide the city of Beijing with its first venue dedicated to digital media art, while offering the most radical example of sustainable technology applied to an entire building’s envelope to date”, said Simone Giostra. The building will open to the public in June 2008, with a specially commissioned program of video installations and live performances by artists including: Xu Wenkai, Michael Bell Smith, Takeshi Murata, Shih Chieh Huang, Feng Mengbo and Varvara Shavrova. GreenPix is a large-scale display comprising of 2,292 color (RGB) LED’s light points comparable to a 24,000 sq. ft. (2.200 m2) monitor screen for dynamic content display. The very large scale and the characteristic low resolution of the screen enhances the abstract visual qualities of the medium, providing an art-specific communication form in contrast to commercial applications of high resolution screens in conventional media façades. Xicui’s opaque box-like commercial building gains the ability of communicating with its urban environs through a new kind of digital transparency. Its “intelligent skin” interacts with the building interiors and the outer public spaces using embedded, custom-designed software, transforming the building façade into a responsive environment for entertainment and public engagement. The full integration of media/information technology with architecture in an urban context represents a new kind of communication surface devoted to unprecedented forms of art, while projecting information about the behavior and activity of the building to a wide range of distances and engaging a vast audience within the city of Beijing. The innovative use of technology and experimental approach to communication and social interaction defines new standards in the context of urban interventions worldwide, raising global interest in the integration of digital technology with architecture and reinforcing the reputation of Beijing as a centre for innovation and urban renewal.